Trump Tower Chicago is a marvelous 92-story hotel and condo skyscraper located in Chicago’s trendy River North neighborhood. This massive condo development was of course named after real estate mogul Donald Trump and designed by renowned American architect Adrian Smith of Skidmore, Owings and Merrill. The exterior to the condos at Trump Tower Chicago at 401 North Wabash features a chic glass façade, while the interior houses 486 luxurious condominium residences and 339 hotel guest rooms. To Rent A Parking Space At Trump You Have To Be A Current Unit Owner Or Tenant. What's Near Trump Tower Chicago Condos For Sale? Among the many desirable aspects about calling Trump Tower home is the building’s near-perfect location in Chicago’s trendy River North neighborhood. 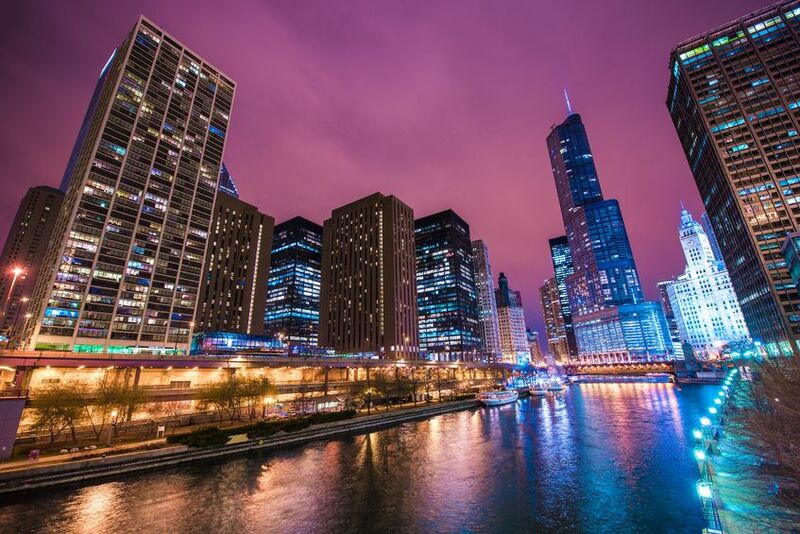 Once a booming warehouse district filled with industry, much of the River North neighborhood has been re-invented into a cultural hub filled with high-end restaurants, a wealth of art galleries, and some of the most expensive real estate you’ll find in downtown Chicago. River North’s eastern boundary line is actually the main stretch of downtown’s renowned Magnificent Mile, so local residents are always just a short distance away from Chicago’s major shopping district, no matter where your home in River North is located. Endless retailers along with a number of highly-touted restaurants define this main drag of Michigan Avenue, but if you’re not quite as familiar with River North, you’ll quickly find that fabulous dining, shopping, and entertainment opportunities are scattered all throughout the neighborhood, not just on its east side. Many residents who already call River North home also love the neighborhood’s close proximity to both the Loop, which is right across the river, as well as Streeterville and the Gold Coast, which is home to a number of different downtown attractions. As mentioned, the Magnificent Mile is only blocks from most places in River North, while Navy Pier, the Contemporary Museum of Art Chicago, and Oak Street Beach are also within a very close proximity to both River North, and more specifically Trump Tower Chicago. Additionally, Chicago’s world-class theatre district is also walking distance from 401 N. Wabash, so enjoying all the latest shows, concerts, and live performances that come to town really couldn’t be easier once choosing a chic new condo for sale or rent here at the immaculate Trump Tower Chicago. How Much Do Trump Tower Chicago Condos For Sale Cost? Although market conditions are always changing, Trump Tower will likely still be one of downtown Chicago’s most expensive and exclusive condo buildings for decades to come. Its location right on the main branch of the Chicago River affords some of the most spectacular views of any building in the city, and given it’s also among the tallest as well, the building’s height also doesn’t hurt some of the unique and mind-blowing outlooks from most of its living spaces. Back in late 2014, the unfinished penthouse at Trump Tower set a sales record for a downtown condo at the time, selling for $17 million. As one of the highest private residential living spaces in the Western Hemisphere, it’s not all that difficult to realize the value behind such an incredible opportunity, but not every unit inside Trump Tower Chicago requires that kind of wealth. Hotel-condos for sale at Trump Tower make for a great investment and start in the high $200s to low $300s, while full-sized one-bedrooms typically price anywhere between $500,000 and $1 million, depending of course on square footage, finishes, and what floor the unit happens to be located. As for other larger two- and three-bedroom condos for sale at Trump Tower, expect the price tag to be somewhere in the neighborhood of $1.5 million to $4+ million, which again largely depends on each individual unit’s characteristics. 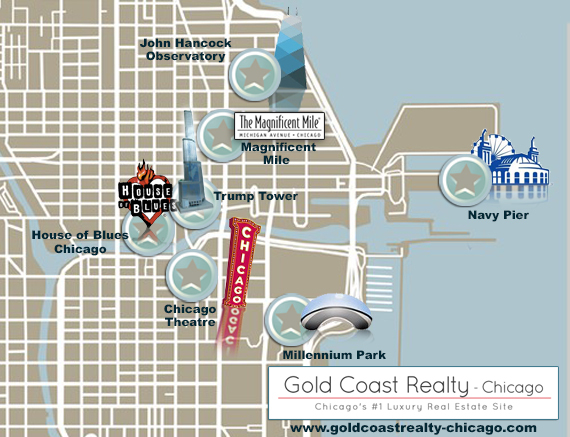 To learn more about condos for sale at Trump Tower Chicago, call Gold Coast Realty today to schedule a showing, or just start browsing all the featured listings above to get full details and photos of each condo that’s currently on the market! As alluded to above, the lavish, hotel-style amenities at Trump Tower are certainly an enticing aspect about this one-of-a-kind downtown Chicago high-rise, offering residents everything from an enchanting spa area to a five-star restaurant located right inside the building. But along with The Spa at Trump, the award-winning Sixteen at Trump, as well as all the other fabulous lifestyle amenities that are listed above, residents at Trump Tower Chicago are also just steps from many of downtown Chicago’s best amenities and attractions as well, which include the River Walk, Michigan Avenue, and of course River North’s trendy dining and nightlife scene that includes dozens of high-end restaurants, bars, and taverns. For additional information about all the different amenities at Trump Tower Chicago, click on any of the links below, or give our team of expert Trump Tower real estate agents a call today at (312) 280-9600. Rebar at Trump Tower Chicago is a chic lounge space that’s as stylish and fashionable as the condos for sale or rent here at 401 N. Wabash. Featuring a modern, yet comfortable ambiance, Rebar takes a whole new approach on food and drinks, as guests enjoy a full complement of hand-crafted house cocktails and a number of different small plates that are sure to make your mouth water. The drink menu at Rebar is largely focused on champagne and specialty cocktails made from only the finest spirits, and trust us when we say there is no better atmosphere to enjoy an after-work drink or a lively night out on the town. Rebar at Trump Tower overlooks the Chicago River and the Michigan Avenue bridge, so if you’re looking for a true upscale environment that fully captures the big city feel of downtown Chicago, Rebar at Trump Tower is absolutely the right choice. Rebar’s hours are as follows: Monday – Wednesday: 4:00 p.m. to 12:00 a.m.; Thursday & Friday: 4:00 p.m. to 1:00 a.m.; Saturday: 3:00 p.m. to 1:00 a.m.; and Sunday: 1:00 p.m. to 12:00 a.m.
*Menus subject to change at any time. Located on the 16th floor at Trump Tower Chicago is the aptly named Sixteen restaurant. This five-star, Michelin Star dining experience truly exemplifies the upscale nature of Trump Tower Chicago, and there’s nothing quite like having a fine dining restaurant housed within your own condo building. The acclaimed Sixteen restaurant at Trump Tower Chicago showcases an array of modern American cuisine made from only the finest quality ingredients from around the world. The awe-inspiring menu, both the drink menu and the food menu, is constantly changing with the seasons and to provide guests with a unique, one-of-a-kind experience, while inside the restaurant, the interior and décor is as lavish and sophisticated as it gets. Along with the award-winning food, your dining experience at Sixteen is complete with massive 30 foot floor-to-ceiling windows overlooking the Chicago River, Lake Michigan, and Chicago’s very own Wrigley Clock Tower. To learn more about Sixteen restaurant, or to make a reservation, call 1-877-458-7867 today. 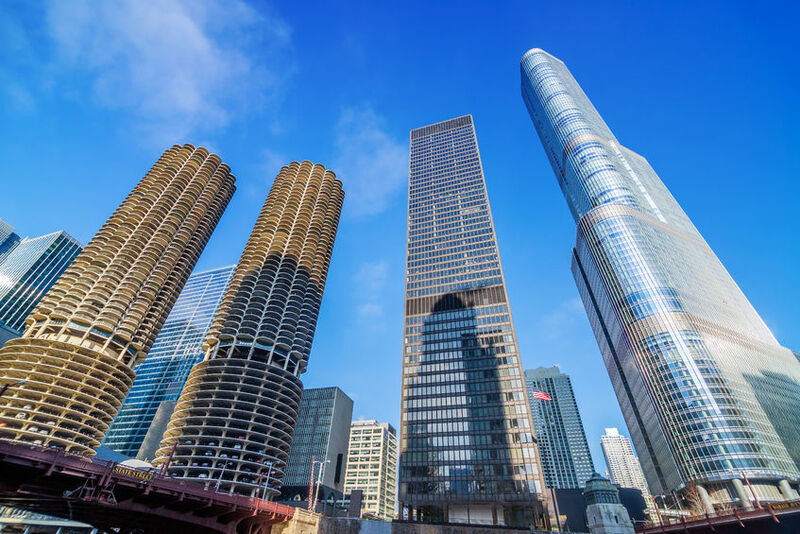 Once investing in a Trump Tower condo for sale, you’ll have easy and convenient access to Chicago’s Riverwalk, which is an amenity not many can say they have when living in River North. The Chicago Riverwalk is an open, pedestrian walkway that lines the waterfront of the Chicago River that stretches all the way from Lake Shore Drive west to Franklin Street. Often called Chicago’s “Second Lakefront,” the Chicago Riverwalk is lined with open green spaces, park benches, outdoor cafés, and even retail spaces that are a hot destination for tourists and local residents alike. If you’re lucky enough to call Trump Tower Chicago home, being able to take a morning walk or an evening jog along the riverfront is as special as it gets, as you’ll really get to experience the beauty and allure of downtown Chicago’s renowned architecture. In 2012, Chicago’s Mayor unveiled plans to extend and rejuvenate the Chicago Riverwalk by expanding it another 6 blocks westward, as well as adding additional restaurant spaces, recreational areas, a boardwalk, and even some floating gardens. Residents at Trump Tower Chicago have access to one of the finest spa facilities in all of downtown. The Spa at Trump® is a 23,000 square-foot space that features 11 spa treatment rooms offering various massage, facial, relaxation, and beauty treatments that are sure to leave you relaxed and rejuvenated. A number of Swiss and Vichy showers and hydrotherapy tubs are also housed within The Spa at Trump®, while guests also can choose from an extensive line of premier spa products that are available for purchase. In addition to the tranquil environment and the full-line of services the spa provides, there’s also a Spa Cuisine Menu, which helps deliver an all-encompassing experience for guests looking to treat themselves to a day full of healing and extreme relaxation. The Spa at Trump® is located on the 14th floor at Trump Tower Chicago and current rates can be found here. Staying fit and leading a healthy lifestyle is made easy at Trump Tower Chicago, as the in-building pool and health club are among the best you’ll find in any downtown condo building. The pool at Trump Tower Chicago is a 75x25 foot heated indoor lap pool with three full lanes, while the exercise facility is equipped the very latest Technogym® cardio equipment on the market. Additionally, television monitors and iPod docking stations are attached to each piece of equipment for maximum convenience and to help make you as comfortable as possible while getting in your daily exercise. Residents at Trump Tower Chicago have the option to be a member at The Spa at Trump®, which gains you supreme access to the health club and pool. Just some of the benefits of the Exclusive Membership at the health club and pool & The Spa at Trump® include entry to the full amenity changing rooms with a private steam room, sauna, and deluge shower, Spa Attaché service, a new member personal training session, a new member Polar Body Age Health Assessment, 20% off Spa services (Monday-Thursday), unlimited number of guest passes, and a host of other benefits that truly make this membership worth every penny. Few will argue the Terrace at Trump is downtown Chicago’s hottest outdoor patio. A chic outdoor oasis with a dramatic cityscape and absolutely fabulous food and drink options, the Terrace at Trump is an upscale amenity at 401 N. Wabash that everyone wants to visit during summers in the Windy City. The mood is set by a wide range of lounge-style music, or even live DJ performances twice a week, and because the Terrace at Trump is a seasonal lounge, both the drink and food menus are crafted accordingly. Refreshing specialty cocktails and light American fare provide for the ultimate summertime dining experience, and the views, as mentioned, are downright spectacular given the terrace is located on the hotel’s 16th floor. So, if you’re looking for a stylish and sophisticated spot to enjoy both the outdoors and award-winning cuisine, the Terrace at Trump is undoubtedly Chicago’s #1 alternative. Seating at the Terrace at Trump is first come, first served, however reservations can be made for the premium tables, which feature the best views available. The hours at the Terrace at Trump are from 2 p.m. to 12 a.m., weather permitting. To make a table reservation, please call (312) 588-8600. When you visit a five-star hotel in downtown Chicago, you might expect valet parking service. However, when you buy or rent a condo in Trump Tower Chicago, this convenient amenity is also at your disposal, which certainly makes sense considering 401 N. Wabash is among Chicago’s most glamorous and lavish condo building. The indoor parking garage at Trump Tower Chicago houses 1,000 parking spaces, and for residents at the building, there’s a specific resident-only section, which helps alleviate congestions and traffic within the parking facility. What’s specifically nice about Trump Tower Chicago parking facilities is that for visiting guest, valet service is available, with rates that are relatively affordable. For more information about Trump Tower Chicago parking and valet rates, click here. One glance at Trump Tower Chicago and it’s easy to see its stunning beauty and impressive stature among the downtown Chicago landscape. But when you really start to examine all the specific design elements and features to this now iconic downtown Chicago high-rise, it’s actually a bit more dramatic than what first meets the eye. Designed by architect Adrian Smith of Skidmore, Owings and Merrill, The first thing you’ll probably notice about the massive glass and steel structure are the three major setback features, which were originally incorporated to provide visual continuity with other high-rise towers in surrounding the area. Each specific setback, or recession in the building’s exterior structure, reflects the height of a nearby building, allowing for Trump Tower to both stand out among the cluster of River North skyscrapers while also blending in all at the same time. In terms of structural support, Trump Tower Chicago is as rock-solid as perhaps any high-rise in the world—literally. The building is cantilevered into a section of 420 million year old limestone bedrock that’s well over 100 feet into the ground. Furthermore, steel reinforced concrete was poured into 4-foot wide holes holding 4-foot wide stilt-like pillars that act as a major part of Trump Tower’s foundation and support-system. 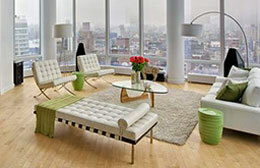 Concrete was also used all throughout the building’s skeleton, as each floor is separated by its own concrete slab. The widespread use of concrete allows for the building to be more fireproof, and in fact, of the building’s $600 million construction budget, $130 million was allocated for James McHugh Construction Co., who oversaw the 180,000 cubic yard concrete-only portion of the construction process. Inside, Trump Tower Chicago has an astounding 2,600,000 square feet of floor space over its 98 stories, which consists of 486 luxury condominiums, 339 hotel guest rooms, and of course some retail area, spaces for a number of five-star amenities, and a parking garage that can accommodate vehicles up to 6’8” high. The initial planning and early stages of Trump Tower Chicago began all the way back in 1999 and after a number of redesigns and modifications due to the 9/11 attacks, today’s version of the tower is the 11th tallest building in the world, as of 2012, and still holds the record for housing the world’s highest residence above ground-level (current as of 2014). In addition to the condos for sale or rent at the Trump Tower Chicago, the River North neighborhood also features countless other luxury high-rise living options. Condo buyers or renters in Chicago interested in Trump Tower Chicago at 401 North Wabash should also check out the residences at 55 East Erie, 21 East Huron, 25 East Superior, 110 West Superior, and 303 W. Ohio Street. For more information about Trump Tower Chicago condos for sale or rent and other River North real estate, contact the luxury Chicago real estate team at Gold Coast Realty today at your earliest convenience! Not seeing anything you like at Trump Tower Chicago? Check out other River North condos for sale, or call Gold Coast Realty today at (312) 280-9600 for help with your new home search!